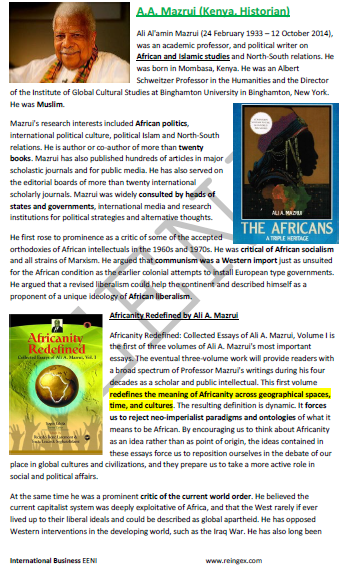 Syllabus of the Online Course (Subject): Ali Al'amin Mazrui (Historian, Kenya). The Kenyan Historian Ali Al'amin Mazrui -A.A. Mazrui- (1933 - 2014) specialises in History of Africa, African politics, Islamic Civilisation and international relations between North and South. A.A. Mazrui has written more than twenty books. A.A. Mazrui was the editor of the Volume VIII (Africa since 1935. Independence of African Countries) of the UNESCO General History of Africa. Ali Al'amin Mazrui belongs to East African Economic Area (African Civilisation).